Intermission is a sound work to accompany A Sac of Rooms Three Times A Day by Alex Schweder. A Sac of Rooms Three Times a Day stuffs the four rooms of an 800 square foot house into a building envelope of a 500 square foot bungalow. Through this misfit, an architectural space results with deformations, writhings, and contortions as the rooms inflate and readjust to their volatile adjacencies. 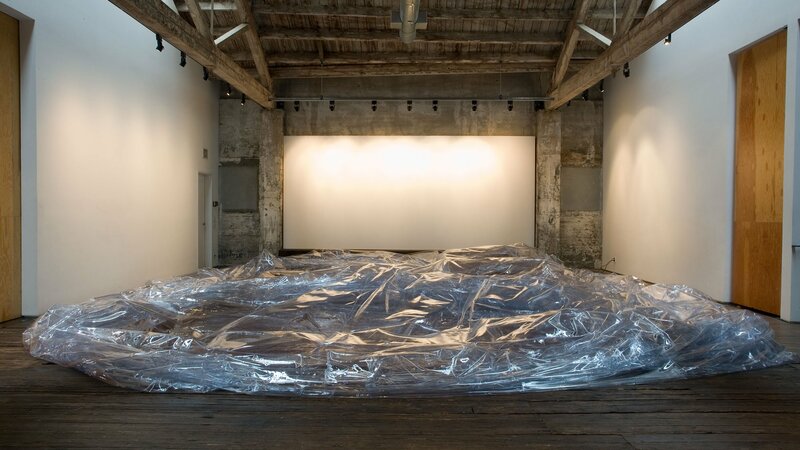 Although the timed “score” of fans turning on and off remains the same for every performance, the material and architectural result of the vinyl sacks is different each time that the rooms fall upon one another in different configurations during the deflations. Intermission is designed as a complement to the resting phases of A Sac of Rooms Three Times A Day, the sound work is created from recordings gathered during the installation’s active phases. The piece supports the glacier-like stillness of the deflated rooms by creating an icy landscape with references to the sac’s past and future.